Despite the terrible forecast I made my way to Rosneigr this weekend for the 2nd part of the 4 nations championships. Unfortunately the forecasters got it spot on and it was like a mirror for most of the weekend, but we still had plenty to do thanks to Bucky at Funsport and John Hibbard. 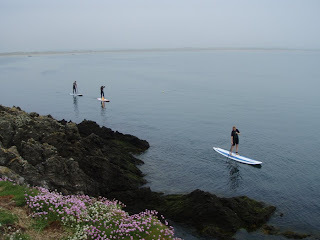 John had a full range of paddleboards for testing so we went for a cruise around the islands at the back of the bay. A lot more fun than I thought it would be. Friday night was snowboard night at Llandudno ski centre. Really good fun, with skiing, snowboarding and even a tobogganing run on the side. Standouts were John H and Dave Horrocks who despite clearly being pretty new to the sport gave it their all and went off the big jump ramp showing that what they lacked in experience they made up for with balls. Sunday saw a mass outing to Salvation Island by whatever means possible. All in all a great weekend.